BRUSSELS -- A vermilion tailor-made fur garment of traditional Chinese style has been put on the "first citizen" of the Belgian capital of Brussels -- the bronze fountain sculpture of "little pee boy Julien" on Monday. Julien's newest clothes of vermillion color, also known as China Red, was donated by China's "fur capital" Haining city of Zhejiang province. It is the 819th in his wardrobe since the tradition to "dress the city hero up" started over 300 years ago. The vermilion coat with traditional Chinese patterns symbolizing fortune, vigor and passion on it, is the boy's third Chinese costume after a mandarin jacket presented by the Beijing municipal government in 1979 when Brussels celebrated its millennium, and a Chinese space suit in welcome of the visit by Chinese astronaut Fei Junlong in 2006. 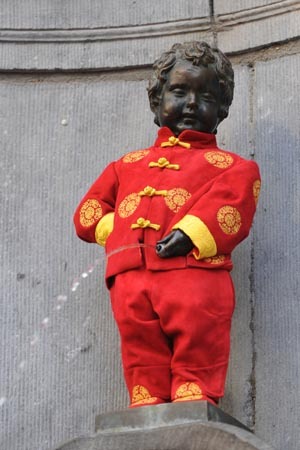 The statue of urinating Julien, now commonly known as the landmark fountain of Manneken-Pis in Brussels, was built in memory of a boy who saved the city by urinating on the fuse of gunpowder lit by enemy troops hundreds of years ago and later honored by the city as the "first citizen." During the donating ceremony, Shi Zhendong, vice mayor of Haining, said this piece of traditional Chinese clothing includes the latest international fashion elements. It is also an embodiment of China's innovative fur industry and exhibits the new image of China's manufacturing sector, he added. Edmond Vandenhaute, president of the non-profit association the Friends of Manneken-Pis, who attended the ceremony on behalf of the Brussels municipal government, spoke highly of the new apparel, saying that "it is one of the most beautiful costumes Julien has received" and the best symbol of Belgium-China friendship. Stefano Missir di Lusignano, vice consul of Belgium in Shanghai also came all the way to attend the ceremony in Brussels. This piece of Chinese fur clothing is of special significance, as cooperation between Europe and China continues to broaden and deepen, he said.